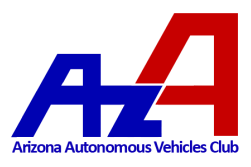 Welcome to the Arizona Autonomous Vehicles Club's website! The Arizona Autonomous Vehicle Club, or Arizona Autonomous for short, is a student engineering design team at the University of Arizona which designs, builds, and competes with Unmanned Air Vehicles (UAVs) and Unmanned Ground Vehicles (UGVs) at national and international competitions. This Saturday, September 30th in ECE 111 AZA will be having another weekly team meeting where all three subteams can get together and work on their tasks. New members are always welcome. We will be meeting in AZA ECE 111 at 2pm!